The climate marches organised by secondary school pupils in Brussels exploded into other cities on Thursday, seeing more than 30,000 people in total take to the streets of the capital, Leuven, Liège, Antwerp, Charleroi and Tournai. In Liège, primary and secondary pupils marched together, along with college and university students. 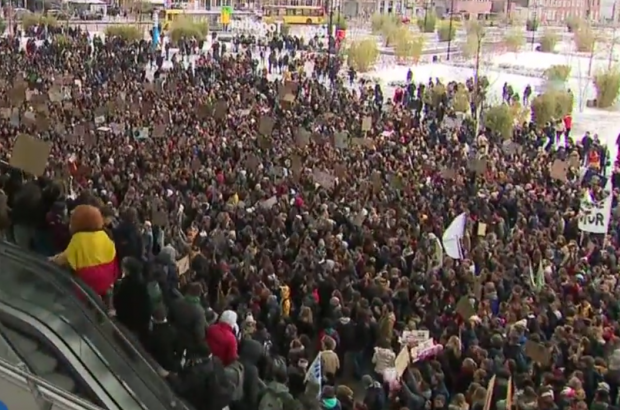 The city supported the march and promised that no one would be punished for skipping school. Some schools in Flanders are taking a different route, trying to get pupils to stop being truant every Thursday by putting on climate-related lessons and activities. One of the region’s education networks has stated that truancy is still against the rules, for whatever reason, while the other networks are asking pupils to state their reasons for wanting to skip school to attend the marches. Youth for Climate, which has a website in the meantime, delivered five demands to politicians at all levels of government: Decrease emissions by 10% by 2050, a ‘competent’ federal climate minister, free public transport, affordable renewable energy and no additional tax burden for average and below wage earners. The pupils plan to march, at least in Brussels, until the elections – regional, federal and European – in May.